This will go down as another great month for the 12athon! Nathan and I started working on this month’s 12athon weeks ago, when we spent a couple of Sundays volunteering to walk dogs at the Guilford County Animal Shelter. On our first visit, we found out that two of the dogs we had walked back in June (Roxy and Caleb) had been adopted. A week later, when we went back to walk dogs again, we found out that the dogs we had walked the previous visit (Hope and Rusty) had also been adopted. We were so excited to hear this great news! On top of the Hoofin’ and Woofin’ challenge, I decided I should take advantage of my day off to do one of the challenges that allowed me to spread my miles over the course of the day. I considered Slacker, but ultimately settled on Three Square Runs. 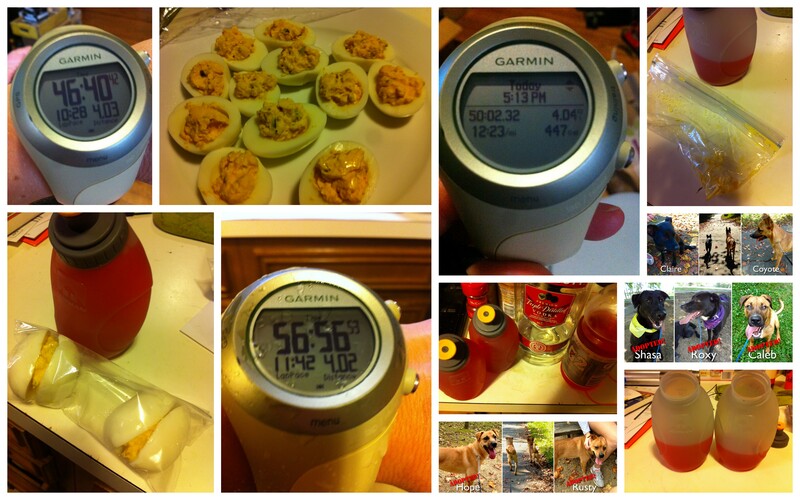 I also decided this would be a good time for eating and drinking, so I cooked up some deviled eggs for the Diabolic Dozen and mixed up a couple of “sports cocktails” for Running Under the Influence, the Double Fister. My second run was fine until I started my third mile. My legs, and in particular, my right calf, started getting really crampy. 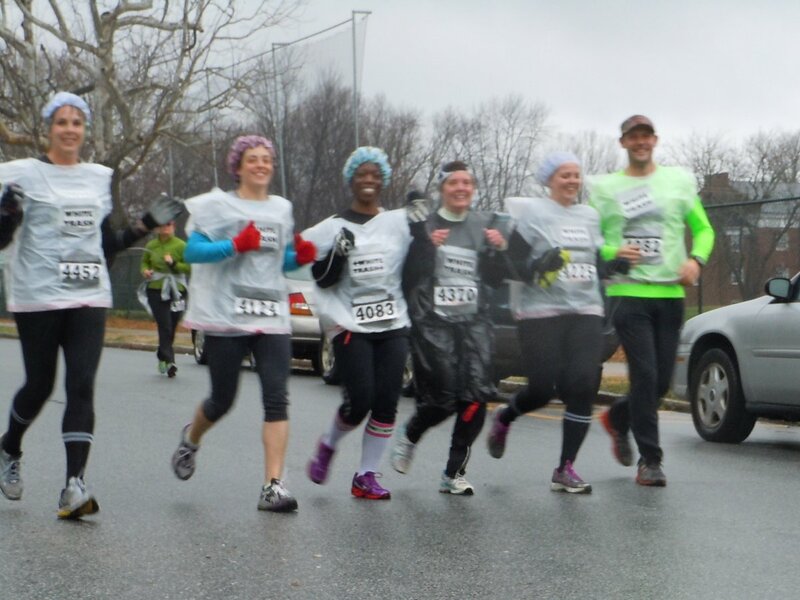 I kept things moving, though at a much slower pace and ended up finishing in a torrential downpour around 1:00. I got dry and put myself on the couch for a couple of hours to rest up my legs for my final leg. I pulled out my compression socks about 5:00 when I started getting ready to run my third leg. I had about 1/4 bottle of vodka and G2 left from both of my earlier runs, so I poured all of that together in one bottle and struck out for my final four miles. 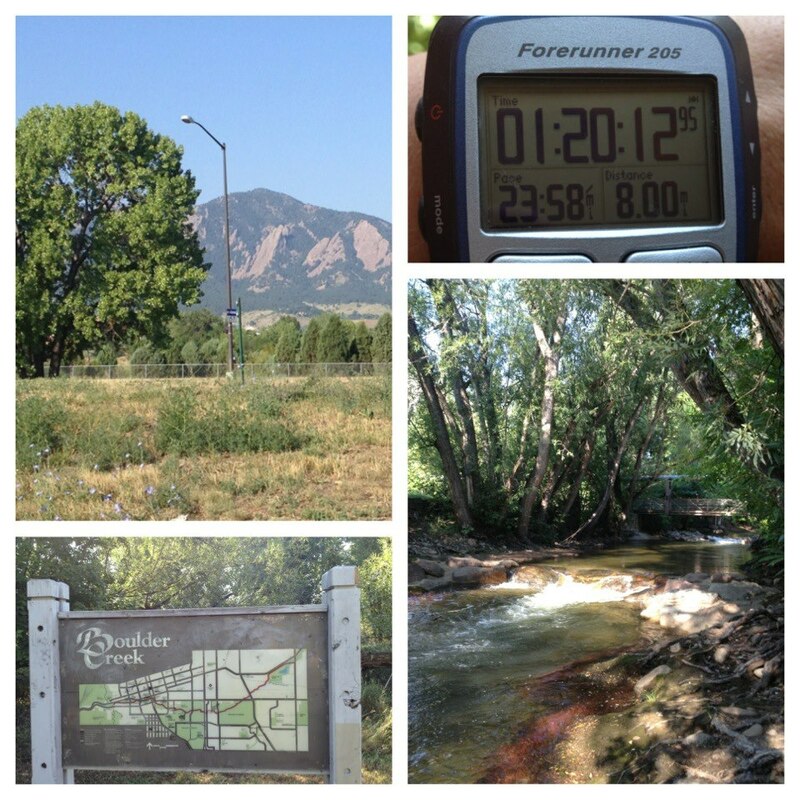 While this run didn’t go as smoothly as my first run, it felt much better than my midday run. I finished up a few minutes before 6:00. So, another one for the books. Done! Katie & I are back at it this weekend taking out a couple more beautiful canines for Guilford County Animal Shelter‘s Running Start Pawgram and this time we brought reinforcements! My nieces, Jessica & Colby, joined us for a 6-miler jaunt through Gibson Park and we had a blast. Before I start gushing over Claire & Coyote, I’m thrilled to announce that the two dogs we took out last Sunday, Hope & Rusty, have both been adopted after being at GCAS since March!! Now on to Claire and Coyote. From what we were told, these two have not spent much (or any) time together, but they were so adaptable. Coyote was extremely playful (as you might expect from a sub-2-year-old) and Claire appeared to just tolerate it…until she would dish it right back. My 11 & 13-year-old nieces joined us for the entire 6 miles and got along extremely well with the pooches. Katie and I quickly agreed that we would adopt Coyote ourselves if we didn’t already have our hands full with our awesome cat & dog. You can view a bunch more picture from our day with Claire & Coyote in our Facebook Photo Album. Bring our own retractable leash and adjustable chain collar. Those disposable rope leashes are rough on the hands. Try to take the dogs to a path that has a running stream next to it so the dogs can frolic and drink some water. Bring a collapsable water bowl for especially hot days. We can’t wait to do this again! Back in June, Katie and I participated in the Guilford County Animal Shelter‘s Running Start Pawgram. This program is awesome! It gives some of the more active dogs in the shelter a chance to get out their ya-yas before the shelter opens to the general public. That way, the prospective adopters have the opportunity to see what the dogs would really be like if they lived in a setting that allowed a more active lifestyle, and the dogs have more of a chance to be taken home to a loving family. Our schedules, weather, and other such excuses have prevented us from taking dogs out since then, but we’ve recommitted ourselves to the effort! While we do have some other motivation behind taking the dogs out (the Hoofin’ & Woofin’ bonus challenge for the Virtual 12athon), we really love meeting these wonderful dogs that just need another chance for a permanent home. In fact, we found out today when we picked up the dogs that all three of the dogs we took out in June have been adopted! The two dogs they shared with us this morning, Hope & Rusty, were a bit smaller than the previous three, but they were so sweet & spunky. We took them on a 6-mile walk/jog on the greenway at Gibson Park where we can take little side-adventures off the trail and frolic in the stream. Rusty was game for most anything, but Hope needed to take a little more time to analyze and experience the situation once before diving in. Lovely creatures, aren’t they? You can see more pictures in our Facebook Photo Album, Adopt Me 2.0! More to come next weekend! 208 Miles of Awesome Coming Your Way! Oh man, what have we gotten ourselves into?! Actually, I know exactly what’s in store for us. 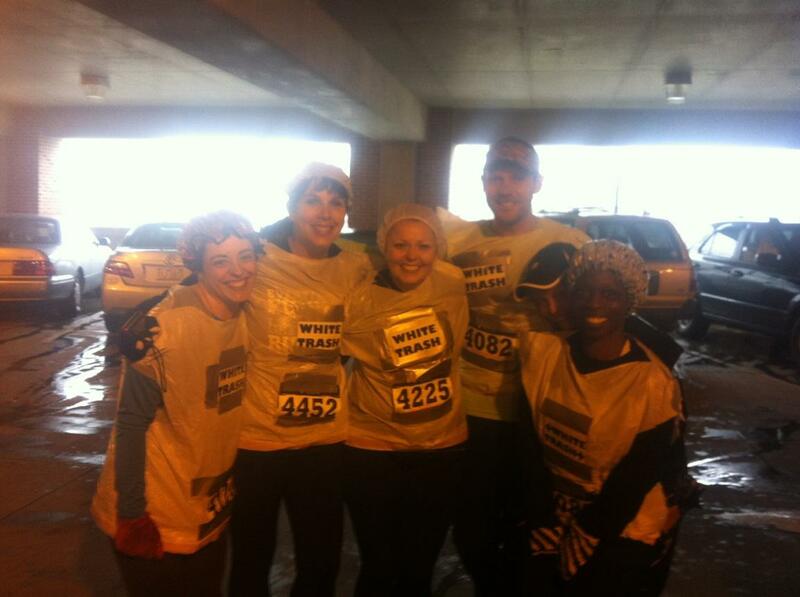 I was fortunate enough to do this race 2 years ago and had the time of my life. While my team members in 2010 were great, I really only knew 3 of them. This time around, we built a team around some of our favorite people on the planet who we knew would elevate the level of fun and awesomeness at every twist and turn of this mountainous course. I honestly couldn’t be more thrilled to spend 36 hours in a van with these people! Follow us on Twitter (@TheWooHooCrew). 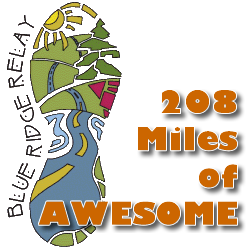 Follow our Twitter hashtag for the Blue Ridge Relay (#WHCBRR). Visit our Facebook page (facebook.com/WooHooCrew) for less frequent updates throughout the race. Don’t worry, if you miss out on the live feed, we’ll be unleashing plenty of video & pictures on you upon our return! Today was July 12th! That’s right! That means 12athon! This month, our plan was to all do our own thing but meet up in the evening. Some for miles, some for tacos. In addition, we were happy to have a few folks who were new to 12athon-ing join in the fun (even if some did it from afar). 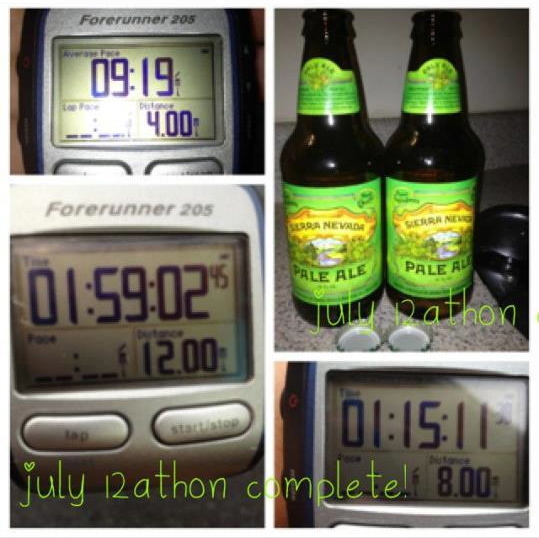 So, without further adieu, WooHoos recap July 12athon! I planned on running all 12 miles today, but reconsidered late last night. 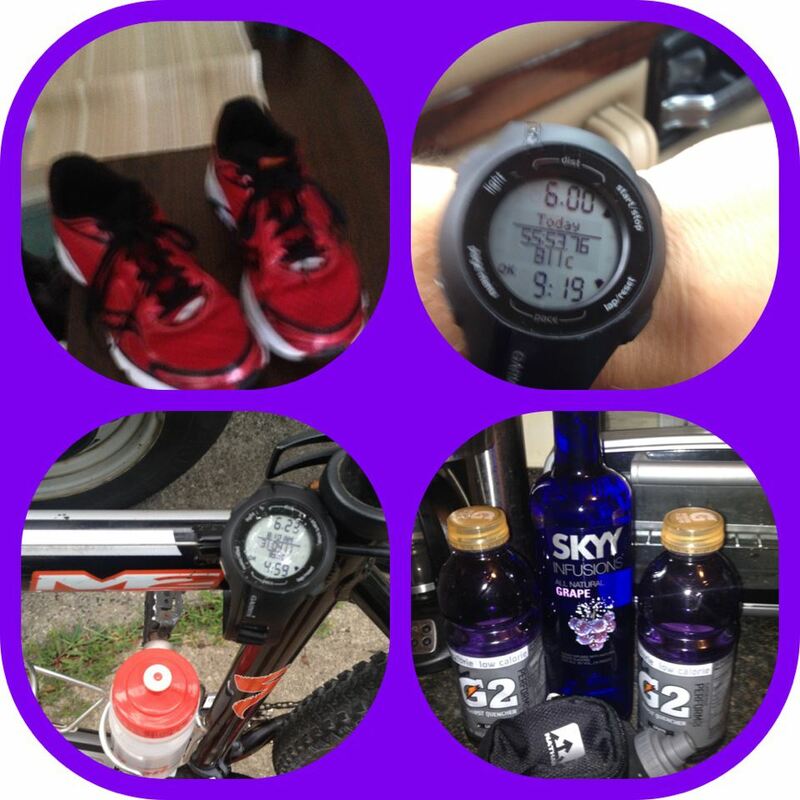 I got up early and prepared both my running and my cycling gear and drove out to Spencer Love. I pulled on my Mirage (with a 4 mm drop) and grabbed my bottle full of G2 Grape and Vodka and ran from Spencer Love on the greenway to the trail head of Wild Turkey and Nathaniel Greene Trails and then back to the tennis center. 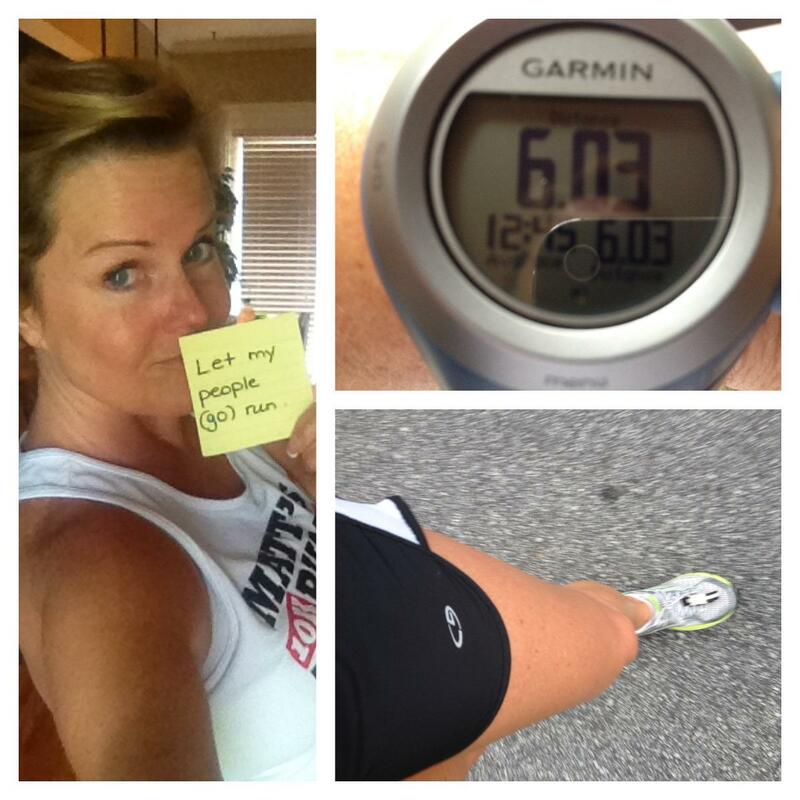 I drank a bit throughout the run and completed my 6 mile run in a a little over 50 minutes. I arrived back at Spencer Love with an empty bottle ready to ride a bit. I pulled my bike out of the Jeep and checked it over making sure I had bottle two of the G2 concoction. I rode through the parking lot (hadn’t rode in months) and looped through Country Park into Military Park where I rode two loops (with the occasional sip of my G2 cocktail). Two interesting things happened here. First, I ended up riding most of the time with an older gentlemen on his bike talking about other people on the paths. And second, he almost wiped out because an owner of a small dog was not paying attention and had his retractable leash all the way out (we know this really bugs 12athon coordinator, Iris). We later saw the same dog barking up a storm at a bigger dog whose owner did not look happy. Anyway, I finished my 6 and some odd miles back at the tennis center in a little under 30 minutes. So for my July 12athon challenge, I completed the base (12) + Bi-Curious (2 sports-7)+Naturalist (6)+Double Fister (12)+2.5 for my percentage points for a total of 39 points. 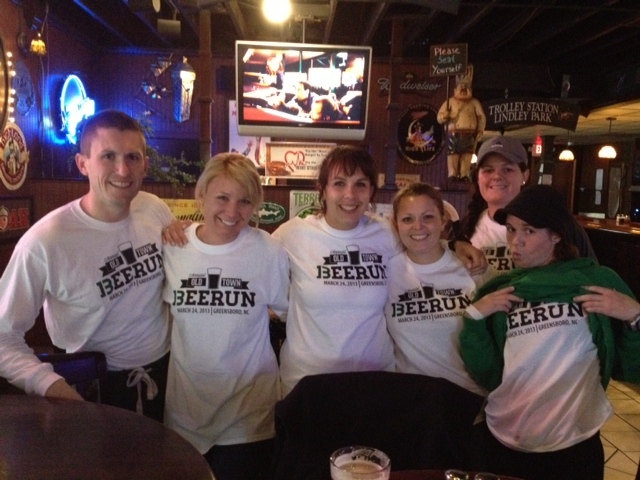 Also, I plan on running another 4 with some others of The Woo Hoo Crew as they finish there 12athon later in the day. All in all, a great morning of running and cycling with great conversation. I started today with 6 miles before work. 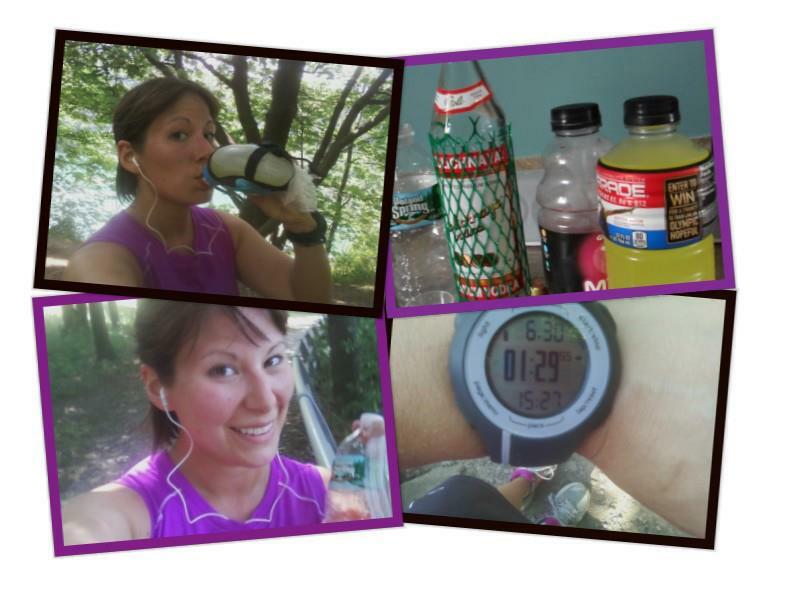 Luckily, I got to finish up my miles with the Woo Hoo Crew this afternoon! Gotta say, the cooler temps are my friend. I felt so much better this week than last. 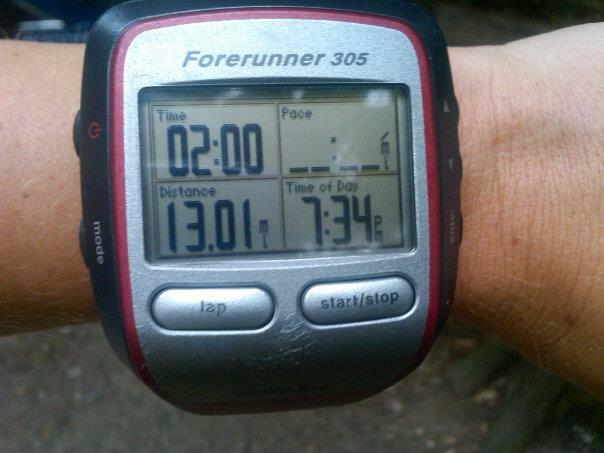 I actually got in 13 miles instead of just 12. Nothing fancy, but my 12 are done! I have to say, I’m loving this summer thing! Today, I got up early to get in my first 4 miles before Nick went to work. Then, I headed over to my school for a little while to take care of a few things making sure to leave in time to finish my mid afternoon run. 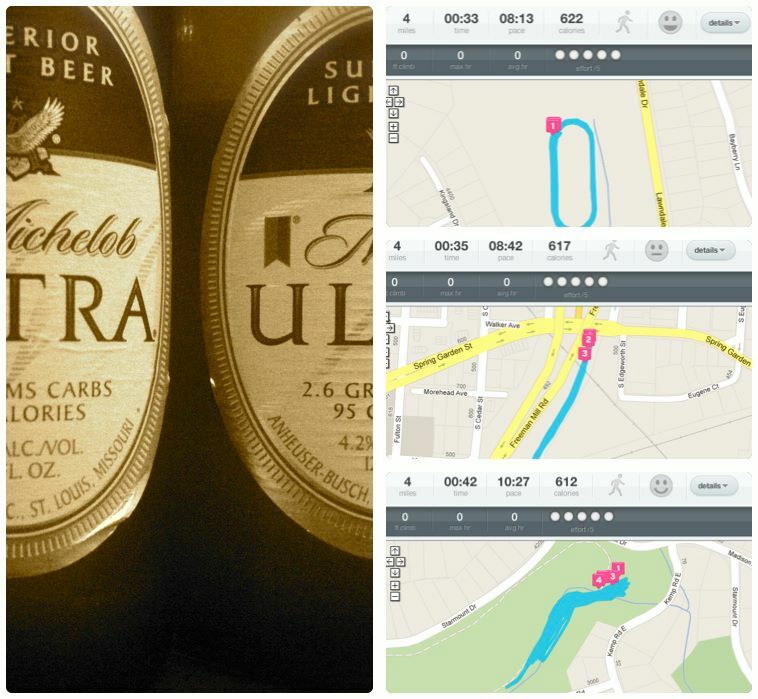 I ran another loop around the house and sipped on 2 Sierra Nevada Pale Ale as I completed my next four miles. 2 chewy beers (as Carole calls them) made for an interesting run. Finally, I hit Hamilton Lakes to meet up with a few other Woo Hoos for my last 4 miler of the day, which ended up being 5 miles when I accidentally stopped my watch (common occurrence! Ha!). It seems like everything was working against me for my introductory 12athon run this month. Potential stress fracture, terrible summer cold…still, I felt like I had some luck with the new rules of the Heat Miser edition. I figured I’d just get out there and see what I could do. Having already planned to take a half day at work, I finished my errands, came home around 2pm, and headed out to the Niagara Gorge Trail. While there are sections where this trail stops & starts, I figured I could earn points for the Woodsy Owl Challenge (even if I was docked a few for the inconsistency of the trail). I stuck with my double fister challenge, because I still have barely any sense of smell or taste due to my cold. How hard could it be to down some gatorade & vodka? (Fun fact: On Tuesday night, I tried straight whiskey for the first time, and could barely taste a thing.) Turns out the worst part about this particular challenge is not the alcohol itself, but the inability to bring water with you, because both hands are full…. Mile 1: Hey, this juice & vodka doesn’t seem bad. the sun is beautiful, and i feel okay. maybe i can knock out 8 or 9 miles even with this cold! Mile 3: Jesus, why is it so freakin sunny? Ugh, I’m dripping. I just really want to get to that gorgeous trail that Katie and I found. Once I find it, I’ll be motivated. Mile 4: water….water…..ok, here’s the trail. Great, take a picture and get the hell out of here. Mile 5: This juice & vodka is terrible. I hate sun. I might pass out today. I wonder who will find my body. Mile 6: Maybe I can run just a few more minutes…nope. Just walk. Oh, hey Niagara Falls tourists, please don’t look at me doing this walk of shame. It’s freakin hot out, what do you expect! I had spectacular plans for my first 12athon, yes, had. Unfortunately, my AC had to ruin everything. So, instead of getting to have fun with all of the other Woo Hoos, I spent the majority of my day without food, whining (OK…closer to bitching) and waiting for someone to show up to fix the thing. Such is life. Ten hours past my original start time, I finally was able to get out mid-afternoon for a straight-up 6.03 miles. In hindsight, there’s no logical explanation for not at least pulling off a double-fister as I had nothing better to do during all that wait time other than sing old southern spirituals & feel sorry for myself. There’s always August and I’m definitely ready to take on some bonus challenges and add some flair to my run! I hate 10 hour days with a passion. And, when you try to fit in a 12 mile run with 10 hours of work, it becomes even more challenging. However, I managed to get in my 12 and take on two bonus challenges to go with it (Rush Hour and Double Fister). Had I been on my own, there is no way I would have made it through. Nathan was a huge help! He brought me stuff so I could get ready for work after I ran to work, and came by my office before he went home to take everything home with him. That’s a good man! It’s always interesting trying to accommodate two 12athoners in one house (and two competitive 12athoners at that!). Katie already sang my praises, so I won’t go into any more details about that. I did the RUI Double Fister, Three Square Runs, and Sisyphus, but did so in three different locations, decided by convenience. 5:10am – Greensboro Day School Track – Guzzled the entire Michelob Ultra #1 just before running 16 laps around the 1/4-mile track. 12:00pm – Downtown Greenway – This is literally right next to my office, so why would I not use this as the second location on my lunch break? 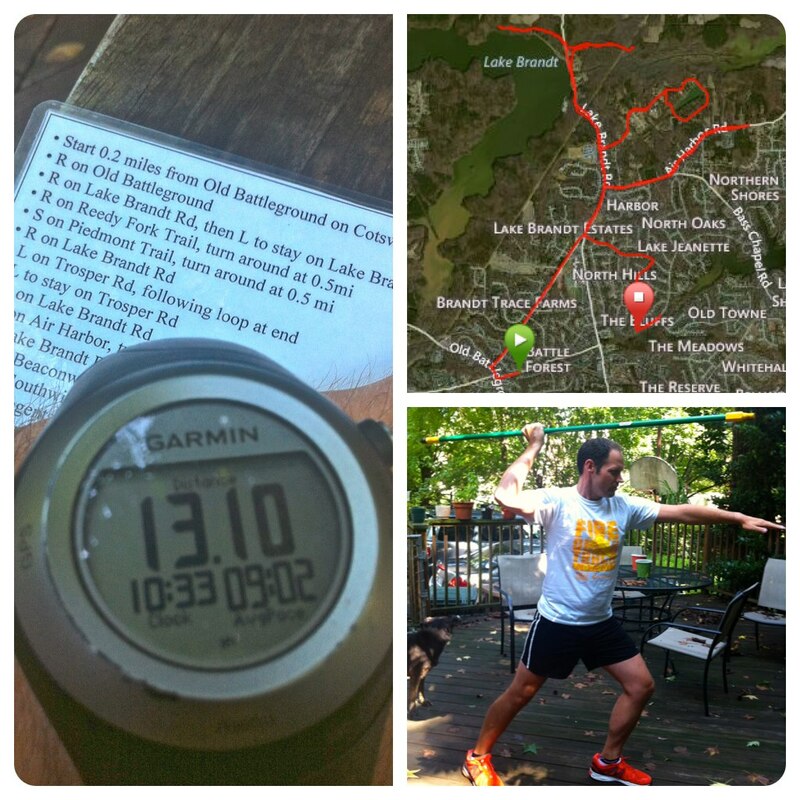 Oh, that’s right…hills! Ran 1/8-mile out-n-back 16 times. It was not pleasant. The nice folks in the tent city next to the Greenway must’ve thought I was nuts, a they watched me pass them by 32 times. 6:30pm – Hamilton Lakes – The main entrance to the trail is just a mile from my house, so this was perfect for the last run of the day. 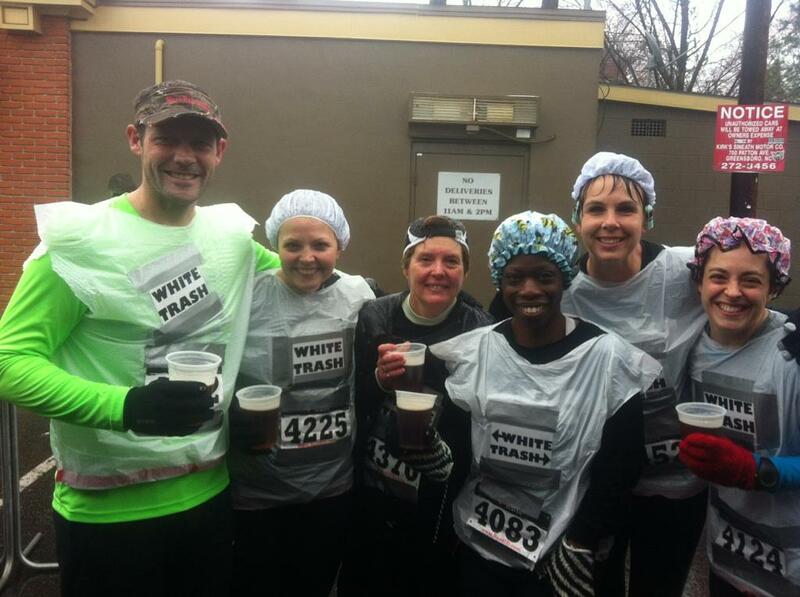 Plus, it’s less than 5 miles from dollar tacos – the real reason we run! I had plans of doing a nice little 1/4-mile loop, but it’ turned out to be closer to a 1/10-mile loop. I really had no intention of doing it 35 times, so I did another 1/8-mile out-n-back and called it done! As one of the newest Woo Hoo’s & certainly new to the 12athon family, I decided to simply focus on getting the miles in as quickly as I could. I felt great up until around mile 10 but kept pushing until mile 12 was behind me. By then, I had found my 2nd wind and decided to finish it out @ 13.1. Looking forward to next month when I will definitely take on some of the challenges. If you’ve made it this far in the post, we applaud you and reward you with this quick video of the Woo Hoo Crew toasting to the completion of yet another Virtual 12athon. Cheers!